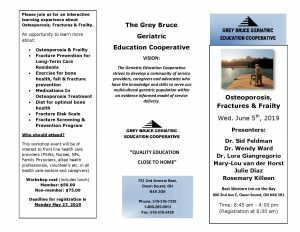 The workshop is being held in partnership with Grey Bruce Geriatric Education Cooperative (GEC) and the Ontario Osteoporosis Strategy on June 5, 2019 at the Best Western Inn in Owen Sound. The interactive session aims at building knowledge and capacity of front-line health care providers (PSWs, nurses, nurse practitioners, family physicians, and allied health professionals), care givers and volunteers. Workshop speakers include: Dr. Sid Feldman, community family physician; Dr. Wendy Ward, Canada Research Chair in Bone and Muscle Development; Dr. Lora Giangregorio, Schlegel Research Chair in Mobility and Aging; Mary-Lou van der Horst, Project Manager, Ontario Osteoporosis Strategy for Long-Term Care; Rosemary Killeen, Director Distance Education and Continuing Professional Development, School of Pharmacy, University of Waterloo and Julie Diaz, Ontario Osteoporosis Strategy Fracture Prevention Coordinator at Grey Bruce Health Services,. Workshop fee of $50 for GEC members and $75 for non-GEC members includes lunch. Pre-registration required by May 27, 2019 to attend the workshop. Please see workshop flyer for more details.